Lamisul is nationally recognized as a traditional company in lumber business. It's path crossed decades trying out various economic scenarios, overcame all odds, under the entrepreneurship of its members and the dedication of its employees. Currently, Lamisul's main challenge is to ensure the quality of your products, by respecting the environment. For that, we work exclusively with certified products by environment agencies, and we require of our suppliers lumber extracted from areas with management plan, and with transport covered up by the Forest Source Document (Documento de Origem Florestal - DOF). The company's staff has experienced and qualified professionals, who works to quickly identify our customers needs, and offer the perfect solution, according with the desired pattern in lumber blades. 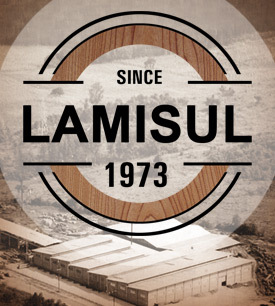 In this forty years of history, Lamisul took as work philosophy the capacity to offer to the market a wide variety of products, in any quantity, because count with consolidated suppliers in the laminated lumber market, and a very efficient transport chain. Thereby, over the years, we established a strategic partnership, that allow us to be an excellent option in the purchase of blades to the most diverse finalities. With a broad line of products, Lamisul is present in the most exigent markets in the world.